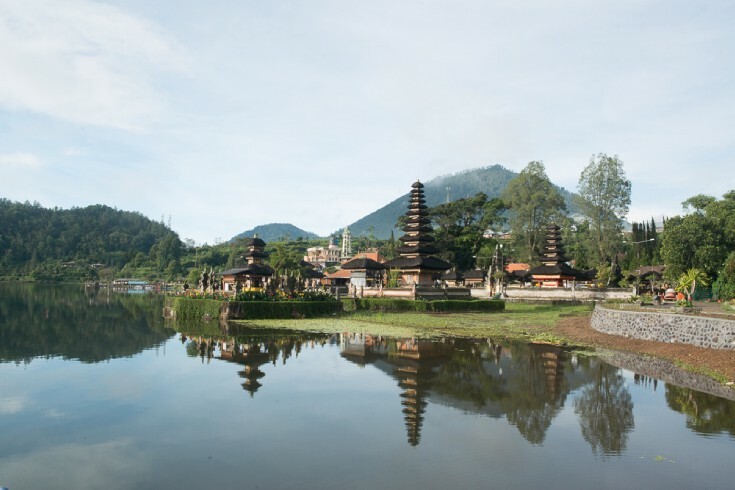 In this week's blog I take you guys with me to the Island of Bali, Indonesia. 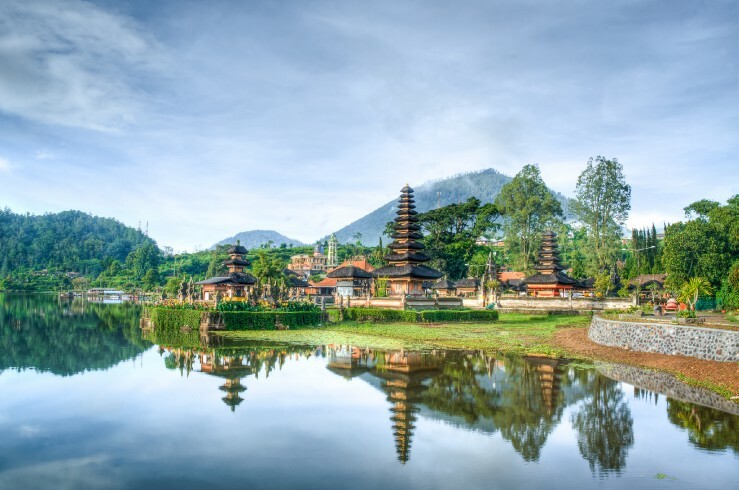 This beautiful stronghold of Hindu and ancient Balinese culture boasts some of the most amazing architecture and landscapes. 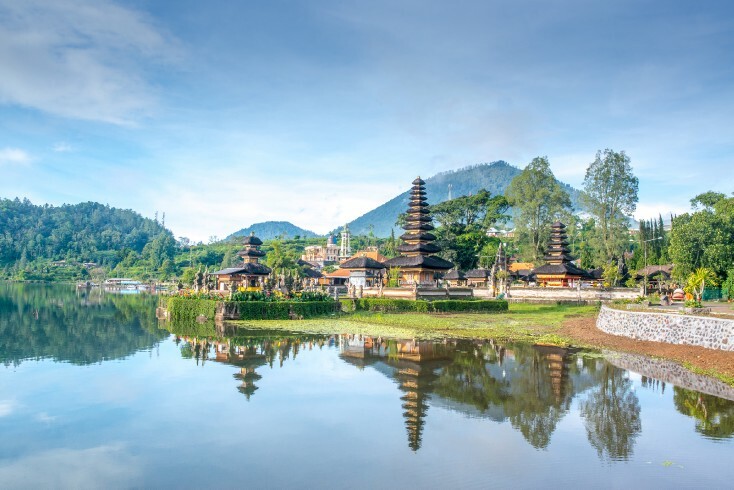 This shot was taken at Lake Batur, a pristine volcanic lake high in the mountains of Bali. 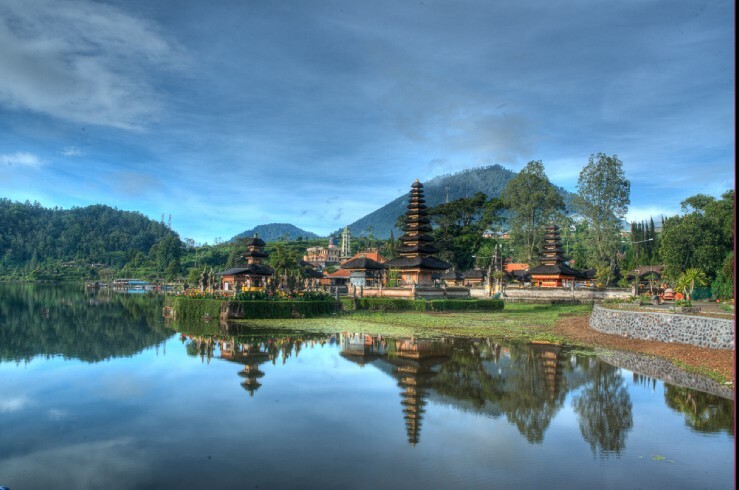 The temple shown is a elaborate example of the thousands of temples found on this tiny island. We left our little village Sumampan and puttered up on a small scooter for several hours to get to this location. Of course when we arrived to this location, the lighting was horrible. Travel photography can be a challenge when our travel schedule gets us into the right spot but not always at the right time. With so many places to go and sights to see, waiting around for sunset might not be an option. In this example the sun is blowing out the sky and the temple is in very dark shade. Instead of getting a mediocre shot I decided to salvage the opportunity by taking an HDR shot. Here are the 3 steps that I take to get that great travel shot even when the lighting is not ideal. Camera Body - You will need an SLR or point and shoot camera that has a "bracketing" function , "manual" mode, or exposure +/- controls. Tripod: This or any other stabilization mechanism is essential for getting sharp images. It will also make sure our 3 exposures are exactly aligned. Shutter release cable - I recommend one of these to get sharper HDR images because every time we touch the camera with our hands we slightly move the camera that can create inconsistency in our multiple frames. Stabilize your camera and take 3 exposures in the same aperture. These 3 exposures whould include one dark exposure, one average exposure, and one light exposure. The key to this step is to make sure your camera does not move between shots. Tripods are highly recommended with a shutter release cable so you never have to physically touch the camera. You can also take 5 shots to get even more dynamic range. Load your raw photographs onto your computer and then combine them into one image. - click on automatically align source images if you think your shots may be slightly off. - click ok and a menu of photo adjustments will appear. Make the adjustments to your liking, then click ok. I prefer to use a program called Photomatix Pro. It does the same thing as Photoshop but I find it has much more features as it is a software dedicated to making HDR photos. - click ok - an image will eventually pop up that looks over saturated and dark, dont worry its the unprocessed image. - click on TONE MAPPING and a large menu of sliders and image controls will appear. - Make your adjustments to your liking and click process. CROP: If you image is slightly misaligned, the merging process will often create a black border. Crop them out. DUST SPOTS: Dust spots may have been missed before the merge process but doing it in the end saves you from doing this 3 times. The best solution is to always keep your sensor clean. STYLIZE: There are a lot of HDR images out there so this last process is the part where you can make your image stand out from the rest. Get creative and HAVE FUN! Dynamic range: This is the ratio in which we discern the lowest and highest amount in light in a scene. When referring to photography, we compare different increments of light in "STOPS". When I talk about bad light I am sometimes talking about a dynamic range that is too large to properly capture with a camera. In this case the sun was almost pointing directly at me and the subject was in deep shade between me and the sun. The range of light from the bright sun and dark shade was too large for me to capture with my camera. The human eye for example can process up to 24 stops of light where most cameras can capture only around 10. This often the reason why people say "you can never capture its true beauty in a photo". When we use HDR we use multiple exposures to get a larger dynamic range. With HDR we can get in 3 shots, the right exposure for the sky, the mid tones in the trees, and the shadows in the temples. With the advancement of technology, larger sensor sizes and techniques like HDR we are in fact getting quite close to capturing the true nature of things.